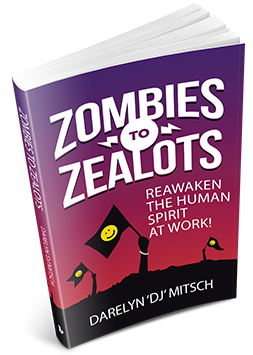 Zombies to Zealots is a clarion call to Reawaken the Human Spirit at Work! If you just said, “Mrgh?” you’re ready to dust off your gifts, face the light, and emerge from the shadows to manifest the right path for your most brilliant contributions. Let these pages in Zombies to Zealots call to you and ask yourself if now is time to Reawaken, Remember, Reconnect, or Rehumanize your organization. It matters not where you begin or end, this easy read is an inspirational guide for coming back to life at work! DJ is a unique blend of head and heart, leader and storyteller. If you’ve ever felt dispirited on or off the job, this book’s for you. Her uplifting insights will resonate with you and motivate you to come alive so everyone you deal with comes alive too!